Hello my name is Steve and I am the owner of Steve’s GreenClean right here in Florence Arizona, and I am excited to introduce “The New Way To Clean Carpet“ to home and business owners in Florence Arizona and the surrounding areas. 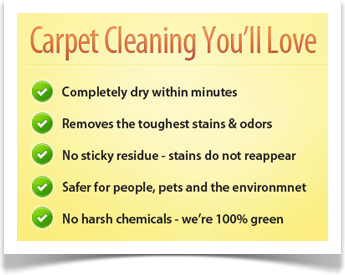 Our specialty is green, eco-friendly, dry “organic” deep extraction carpet cleaning. What this means is no wet carpets, no harsh chemicals and dry carpet cleaning you’ll absolutely love every time. The Problems With Traditional Carpet Cleaning. In a national survey that polled thousands of consumers about their most bothering issues when it comes to carpet cleaning, the overwhelming #1 complaint was that their carpet was left too wet and took too long to dry. The #2 complaint was that stains came back after the carpet had finally dried, through a process called carpet wicking. With modern low moisture carpet cleaning systems (like we use), your carpets will be totally dry in 30 minutes or less; stains will not come back; carpets will repel dirt after cleaning; and your carpet will stay clean much longer. Problems Solved! Steve’s is a Local “Family Owned” Business.